Coming home from the gym today, I passed by this bakery, Birdbath Bakery. I have such a weak spot for cookies. Cake? dont need it. Ice cream? pass. Brownies? no thank you. But cookies? I. Cannot. Resist. Cookies. So after I elliptical-ed (is that a word? It is now!) for an hour (ok, ok, 45 minutes) I wanted to take a peek inside the bakery. Maybe get a muffin or something. And then I saw a stack of cookies in various flavors. Some of them were vegan, and some weren’t I ended up getting 2 vegan cookies, and 1 not vegan- the chocolate chip, for 5 dollars. You can check out their website here- they are pretty amazing! ANYWAY, back to the goodies. I already froze the other two cookies to eat later, because I KNOW I would eat all 3 in one sitting if they were in front of me. This cookie. Was amazingly-amazing.I mean, really, HOW could this (half a cookie picture- wonder where the other half went?? =p ) taste bad?!? 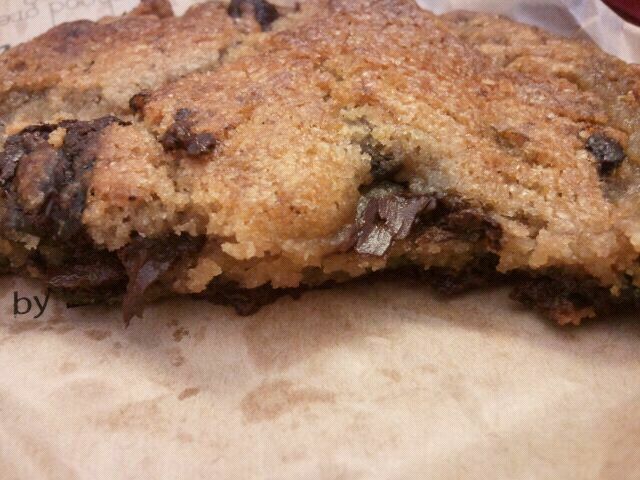 This cookie had the slightest crisp on the outside, and was soft, gooey and rich on the inside. It had a buttery taste, and was rather sweet, but very delicious. I noticed it even had a slight pretzel taste to it- weird – but it worked. It added that very slight salty taste that accompanied the big, gooey chocolate chunks. Overall, a delicious cookie. Aside from the pretzel taste thing going on, a perfect chocolate chipper in my eyes. And at 3 for 5 $, thats a little over $1.50 per cookie, which isn’t too bad. Plus I’m loving the eco-friendly aspect of this place!!! I kinda love this place. I kinda couldn’t stop eating this cookie. In fact I demolished it in about 5 minutes. I kinda can’t go here unless I went to the gym that day. I kinda dont want to know how many calories, fat and sugar is in this cookie. Ever been to a vegan bakery? Which one? What did you get?